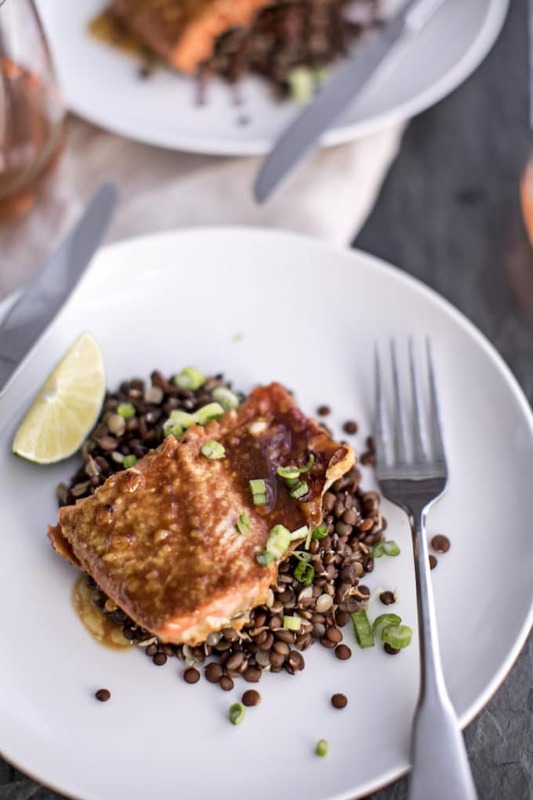 This baked miso salmon recipe with ponzu sauce and sprouted lentils is quick and easy to make, plus super healthy! Gluten free and full of delicious Asian flavor. As part of my anti-inflammatory diet, I try to eat seafood at least two or three times per week. Salmon is almost always part of that rotation–it’s super easy to make, incredibly delicious and so good for you! Admittedly, I often make the same few salmon dishes over and over again, namely these Salmon Sushi Bowls and THIS recipe for baked miso salmon with ponzu. Oh baby, is this recipe delicious! Have you ever had The Cheesecake Factory’s miso salmon? It’s one of their most popular dishes, and even one of the most searched for salmon recipes on Google! Who knew some mediocre chain could spark such a love for salmon? 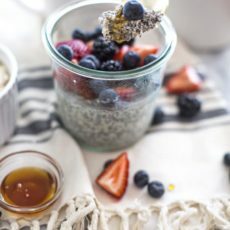 While my recipe is similar, it’s also so much better for you–none of that heavy cream and excess sugar you’ll find in their recipe. 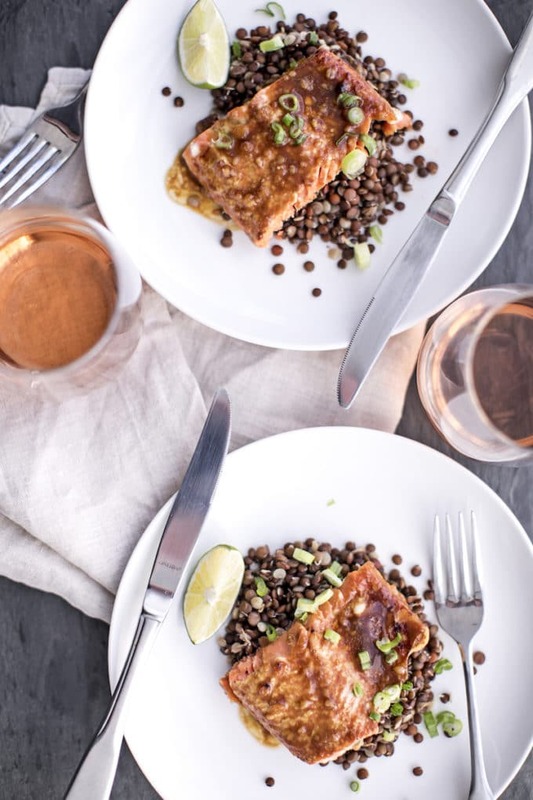 This baked miso salmon is also much cleaner, more akin to Nobu’s famed miso-glazed fish, but with one key difference: my recipe calls for ponzu sauce, the bright and tangy citrus-infused sauce that just brings the flavor of this marinade over the top! Not to mention that you can control the quality of your salmon when you buy it yourself, like opting for wild-caught vs. farm-raised. Do you struggle with finding sustainable seafood at your grocery store? 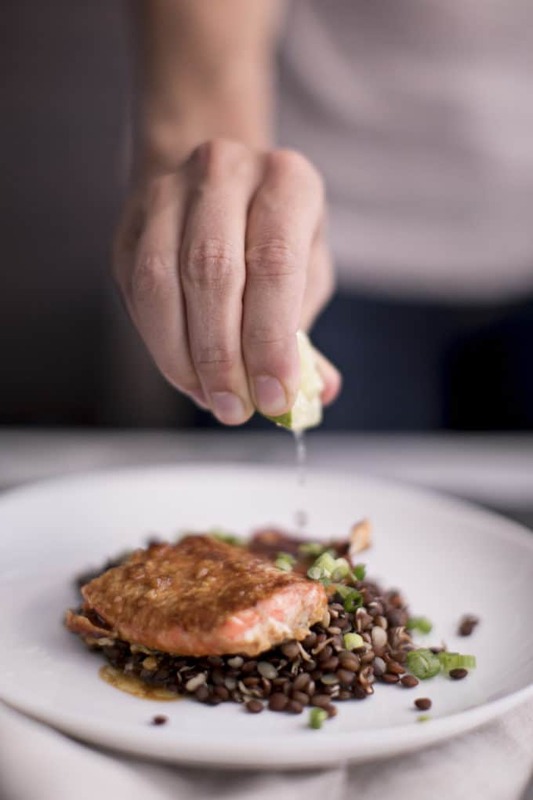 Look no further than Vital Choice, an online retailer selling fresh, wild-caught, sustainably harvested Alaskan salmon and northwest Pacific seafood, like halibut, tuna, shrimp and lobster. All of the seafood found here is certified sustainable either by MSC, the State of Alaska or Monterey Bay Aquarium’s SeafoodWatch program. Plus, they offer healthy Certified Organic foods, making putting healthy dinner on the table a breeze! Get 10% off your order + free shipping over $99+ with the code RANDRVC. 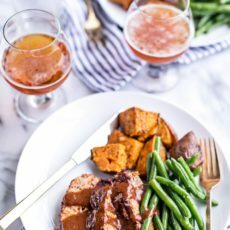 I also like U.S. Wellness Meats, who sells not just wild-caught seafood but also grass-fed beef, lamb and bison, free-range poultry, raw honey and more, all from small, family farms. 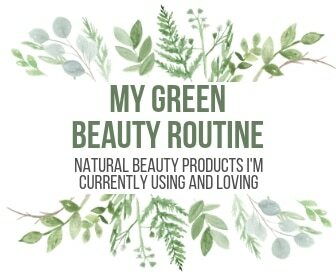 Get 10% off your order with the code ROOT10! Miso, a staple of Japanese cuisine, is soybeans fermented with salt and koji. 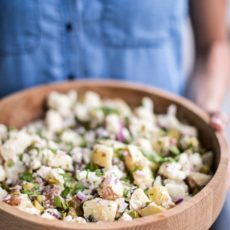 The salty paste is bursting with earthy umami flavor and pairs beautifully with veggies, tofu and, of course, seafood. Which miso paste is the best? Because miso is made from soybeans, which is a GMO-heavy crop (it’s often extracted with carcinogenic hexane), I always look for organic brands. My favorite is Miso Master, which is Non-GMO Verified and also made without gluten or MSG. They also make a low-sodium version and even a paste made from chickpeas, which is great for anyone allergic to soy (hi, Mom!). Where is miso in the grocery store? At most grocery stores, like Whole Foods, Kroger, Publix (even Walmart), the miso is usually in the refrigerated section with other soy products, like tofu and tempeh. Simply put, ponzu is a citrus-based sauce commonly used in Japanese cuisine. It looks like a light soy sauce (and is sometimes made with soy sauce), and it’s tart, with an addictive flavor that adds a brightness and freshness to whatever you serve it with! 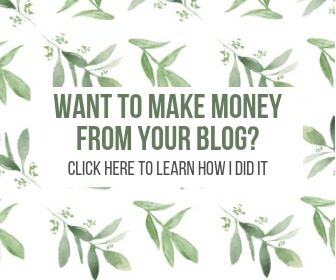 Where to buy Ponzu? Ponzu can be found in the international aisle of most grocery stores, with the soy sauces and other bottles of Asian sauces. I recommend finding an organic brand, like Wan Ja Shan, that uses tamari (gluten-free soy sauce), so you can keep your meal free of processed wheat. How to make ponzu butter: Ponzu pairs really well with rich foods, like butter, as it cuts the fattiness and adds a beautiful contrast. In this recipe, I’m using ghee with the ponzu for a dairy-free ponzu butter that is the perfect complement to the decadent salmon and umami-rich miso paste. And now for the most important part–the salmon! Is salmon safe to eat? The health benefits of salmon are far-reaching: it’s chockfull of vitamin D and omega-3 fatty acids (the good fat), reducing inflammation, protecting lungs and boosting immunity (source). That being said, there is some concern over the mercury content in seafood, particularly if you’re pregnant. Fortunately, salmon is very low in mercury, IF you choose the right kind… see below. Don’t be afraid of frozen salmon. Frozen salmon is flash-frozen at the peak of freshness, and it’s more stable and better controls parasites and bacteria. Plus, often times, the “fresh” salmon behind the seafood counter has been previously frozen. You’ll get the freshest, mildest fish with the least fishy taste if you opt for frozen salmon. Salmon Sustainability: Overfishing is a major concern for all seafood, salmon included. So it’s incredibly important to make sure you’re choosing a sustainable choice that won’t endanger the population. 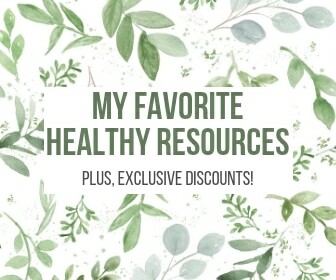 Here are a few great resources to check: Environmental Defense Fund and Seafood Watch. I recommend Whole Foods’ Whole Catch wild salmon (it’s frozen). There’s also an incredible online seafood retailer that I love: Vital Choice. Vital Choice sells fresh, wild-caught, sustainably harvested Alaskan salmon (and other northwest Pacific seafood, like halibut, tuna, shrimp and lobster), all of which is certified sustainable either by MSC, the State of Alaska or Monterey Bay Aquarium’s SeafoodWatch program. Plus, it’s delivered right to your door, making putting dinner on the table a breeze! 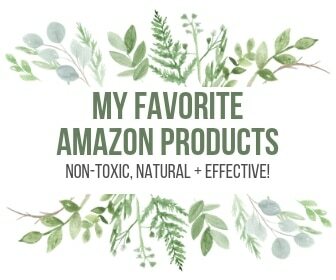 If you use my link and the code VCAF10, you can get 10% off your first order. 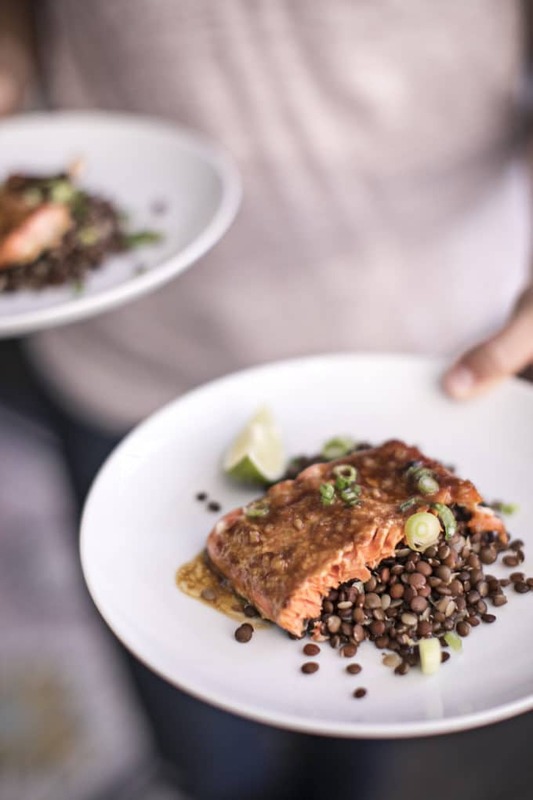 I’ve served this baked miso ponzu salmon with sprouted lentils, which are easier to digest and a delicious base for seafood. But you could also serve this with rice and/or veggies tossed in the miso ponzu marinade. 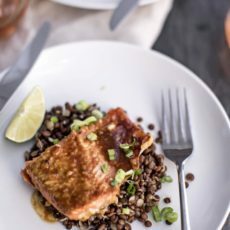 This baked miso salmon recipe with ponzu sauce and lentils is quick and easy to make, plus super healthy! Gluten free and full of delicious Asian flavor. In a medium glass bowl, combine the first 7 ingredients (ghee through honey) and whisk to combine. Pour half the marinade over the salmon filets, brushing to evenly distribute. Broil salmon for 10 minutes, or until medium-rare, brushing with some of the reserved marinade halfway through. Meanwhile, cook lentils according to package instructions. Once lentils are cooked and drained, toss with the remaining marinade. Evenly distribute among two plates, and top each with a cooked salmon filet. Garnish with scallions and lime juice. Serve and enjoy! Next Post » Get to Know Your Gut: What Are Probiotics? Cannot wait to try this dish! I’m so glad you included the part about “what is ponzu” because I was thinking it! This sounds delicious!